I’ve met too many people who believe that all they have to do to succeed is work hard. It would be nice if that were true, but I’ve watched these same people experience disappointment when they are overlooked for opportunities or passed up for a promotion. The reality is that most organizations function as a pyramid – with fewer spots at the top than at the bottom. If it helps you, think of it as a tournament, with the question being: how do I progress to the next round? It’s not enough just to be the most competent. More often than not, those who make it to those top spots do more to be noticed and known by the company’s decision makers. If you want to progress in your career, you must go beyond competence and strategically develop your confidence, credibility, and relationships. How do you do this? The first step is knowing what you want and then preparing to meet opportunities when they arrive. Adopt a growth mindset and develop and live your personal brand so that others know exactly what it is that you stand for and what value you bring to the organization. Maximize your executive presence to help decision-makers and influencers sit up and take notice of your leadership potential. In order to be seen, create and nurture new and existing relationships. As you take steps to develop your credibility and widen your circle of influence, notice how your confidence grows. Pay attention to and celebrate your successes. 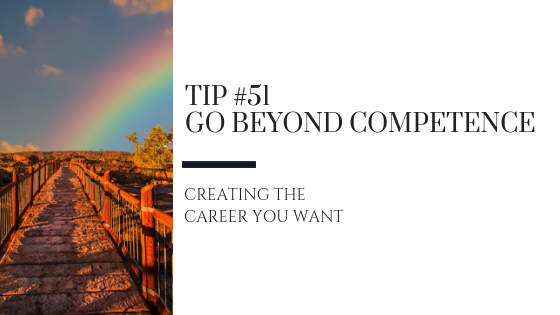 Go beyond competence and do what it takes to be noticed and known as you create the career you want.